This is the sixth time I’ve seen the self-proclaimed “hottest band in the land,” and for me it really does get better with each show. I would go see these guys every night of the week if it were possible, and what better place to host such an epic event than London’s legendary O2 Arena. 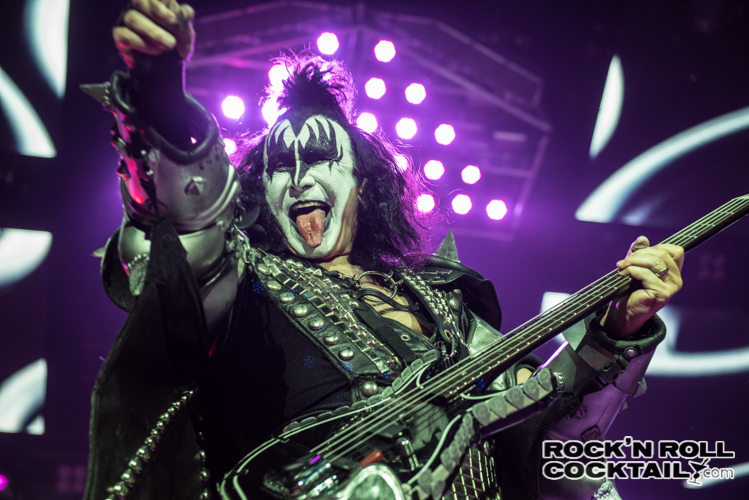 Gene Simmons, Paul Stanley, Tommy Thayer, and Eric Singer took to the stage in front of a capacity crowd to display exactly why they are the kings of the nighttime world. Opening up the evening with a blistering version of “Deuce,” the entire band descended from a steel platform gliding through an enormous cloud of smoke from the opening fireworks. Within seconds Gene and Paul were front and center interacting with the crowd (and the photographers) in classic form. These guys don’t miss a beat and they have the energy of a rock ‘n’ roller half their age. Midway into the set, Paul Stanley asked the crowd “How many of you are seeing KISS for the first time?” I was astonished to see more than half the crowd raise their hands and begin screaming, to which Stanley replied, “This is a night you will never forget.” A bold statement—but one that would ring true by the evening’s end. “Deuce,” “Shout it out Loud,” into “Lick It Up” (the first album I ever bought with my own money!) I don’t want to give away the entire setlist but let’s just say it was EPIC. Chock full of classics both old and new and falling just short of the two-hour mark—which could have easily gone on for another hour—fans were hanging on every note and awed by every theatrical and over the top visual. 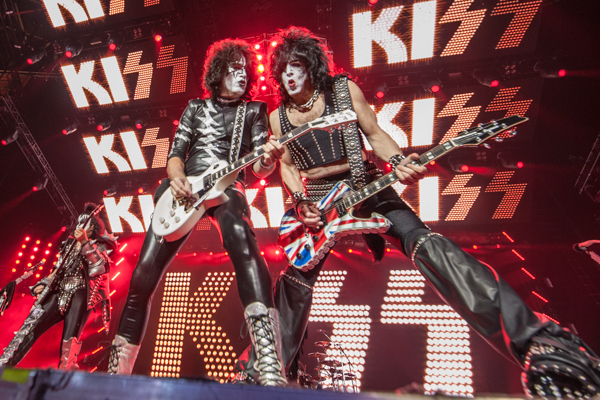 This was not just a rock ‘n’ roll show folks, it was an experience. 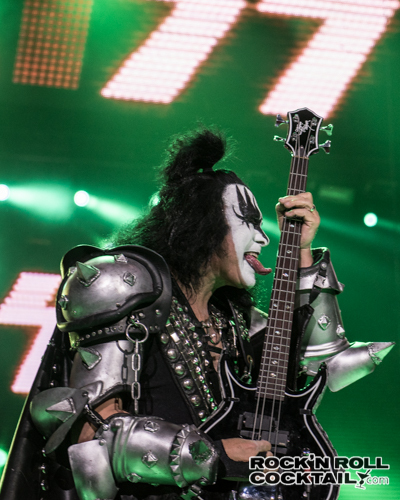 Gene Simmons in his role of the Demon never gets old. His bass solo was followed by thunder and the ringing of the church bell which transitions frighteningly well into the Demon’s signature blood spitting and soaring flight straight up to the top of the stage. It’s a fantastic mix of old school Dynasty-era Demon with a new, modern twist. “God of Thunder” appropriately followed. This show got me thinking about how much longer they can put on a tour of this magnitude. I mean, I have a two-year old daughter who I want to take to a KISS show one day. Will I have the chance to? Maybe. 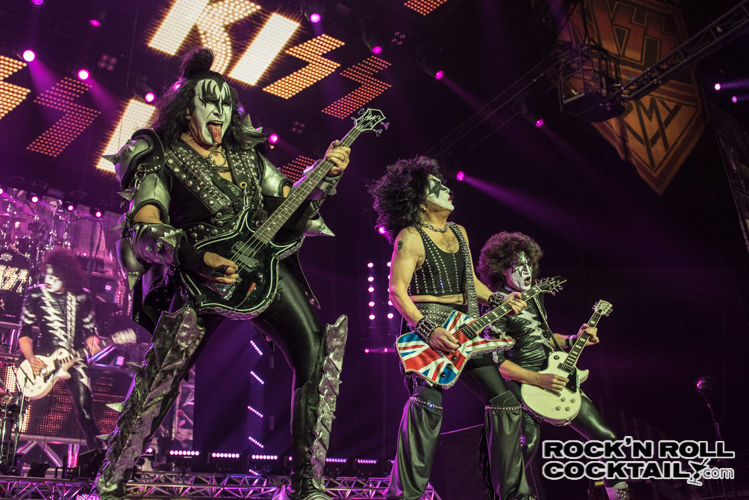 Along with the KISS world tour comes the release of KISSWORLD: The Best of KISS. It’s a fantastic collection that reminds us just how important this band is to the world of rock ‘n’ roll. It’s also the perfect introduction and primer for the next generation of KISS fans to carry the torch onward. One last note—opening the show was New York City’s The Dives. Falling somewhere between Springsteen and The Strokes, these guys were absolutely brilliant and are fronted by Stanley’s son Evan. It’s great to see this kid choose his own path and he’s got one hell of a band to back him up. Their new EP is now available and it’s definitely worth a spin (or a stream). Bottom line, go see this show and celebrate one of the greatest rock ‘n’ roll treasures of all time. Let’s hope they keep going for a 50th anniversary—they certainly have it in them. Check out high res shots in the gallery here.